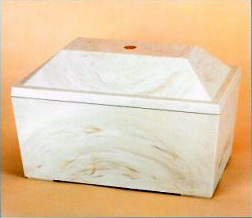 This high quality cultured marble urn vault surpasses industry standards in terms of quality and strength. With a compressive strength of over 23,000 psi, the Sentinel is extremely durable. The vault is also a beautiful work of art. The classic look of white marble gives the vault a museum display-like quality. Comes with sealant. The vault offers unique stackable band accessory that builds to any desired height. 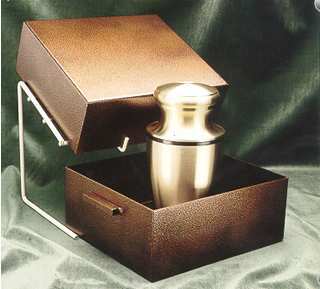 Each band allows an additional two inches of space, and can be added as necessary to accomodate any size urn. 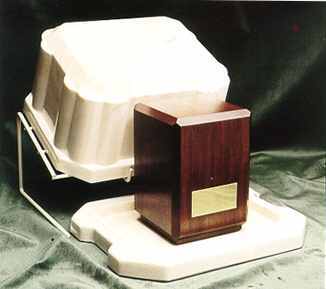 Constructed of moisture proof, non-deteriorating polystyrene. Available in permanently finished marble tone of Sand Spun Beige. Lightweight yet strong enough to withstand 3000 psi. TESTED AND APPROVED by an independent engineering firm. Meets internment specifications for Catholic Cemeteries. Packaged three vaults per shipping carton, sealant, plus 1 FREE band. Additional bands may be purchased separately. Shipment is guaranteed within 72 hours. All prices F.O.B. our factory.